We are pleased to inform you that we’ve relocated our monthly parties to a new home in Brighton; the larger capacity and better established venue, Audio, with its fantastic view of Brighton’s pier and beach. We launch here on Saturday 31st July and we’ve pulled out all the stops to book a selection of truly awesome bands and DJs to kick things off in style. In a change to the original format we’ve now split the evening in two. Firstly, we have our Recommender Live section, which showcases two or three cutting edge bands from around the world. From 11pm we step in to the Recommender Late, which is more of club night, bringing an awesome headline DJ to town, alongside our resident Recommender DJs – consisting of Matt Allfrey, from Battery Powered DJs and Jonny Cassell, from the established Blah Blah Blah DJ crew. YOUNG EMPIRES – First featured on The Recommender here, we are pleased to be bringing this Canadian three piece to Brighton for the first time ever. They arrive with a tidal wave of hype and hungry A&R men, alongside their original, percussive, indie pop magic. The new Friendly Fires anyone? 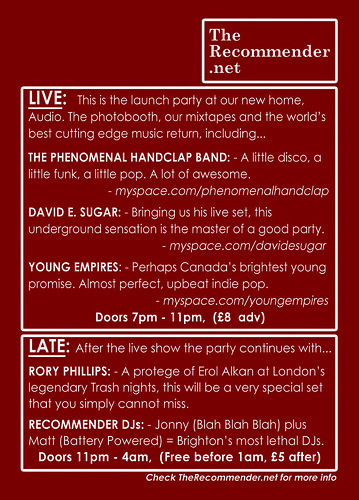 DAVID E. SUGAR – This will be a live set with a band behind this pioneering DJ. Famous for doing extraordinary things with a Speak & Spell, you may well have come across this underground sensation on Kitsune compilations. Most recently he’s signed to Rob Da Bank’s Sunday Best label, which will surely push this artist well and truly overground. 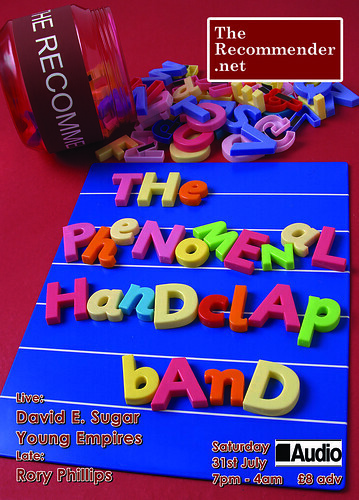 THE PHENOMENAL HANDCLAP BAND – There’s honestly no superlatives or twisted adjectives that could describe just how good this eight piece New York band are. They have absolutely every ingredient to make our party go off. Impossibly entertaining disco, funk, pop and groove are all thumped out by the sexiest band alive today. Prepare to be hypnotized! RECOMMENDER DJs – We bring to Audio our regular partner in beats, the Brighton hipster Matt Allfrey, from Battery Powered DJs, but standing alongside will now be the head of the Blah Blah Blah DJ crew, Jonny Cassell. If you’ve been to any killer parties in the city of Brighton in recent years the chances are one of these two were involved. RORY PHILLIPS – Topping our club night is this extraordinary DJ. He’s the protegé to none other than the DJ overlord, Erol Alkan, having had a residency at London’s Trash night and its modern version, Durr. With a truckload of seemingly perfect remixes under his belt, expect a set of the unexpected – of course played using his signature phone set instead of a pair of headphones. As Brighton’s going out bible, The Source Magazine, put it: “Rory Phillips should be fanfared into town like a god“. Well, we are that very fanfare. This is a truly awesome line-up you have assembled. Unfortunatly I am at Camp Bestival. Hope the next reccommender party maintains the high standard.